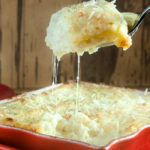 Parmesan Garlic Twice Baked Potato Casserole takes some of the work out of mashed potatoes but adds so much creamy, cheesy flavor. The result? Comfort food at its finest made with ease. There is no need to peel the potatoes or cut them to boil them, just clean the baked potatoes and mash with cream, butter, garlic and Parmesan cheese. 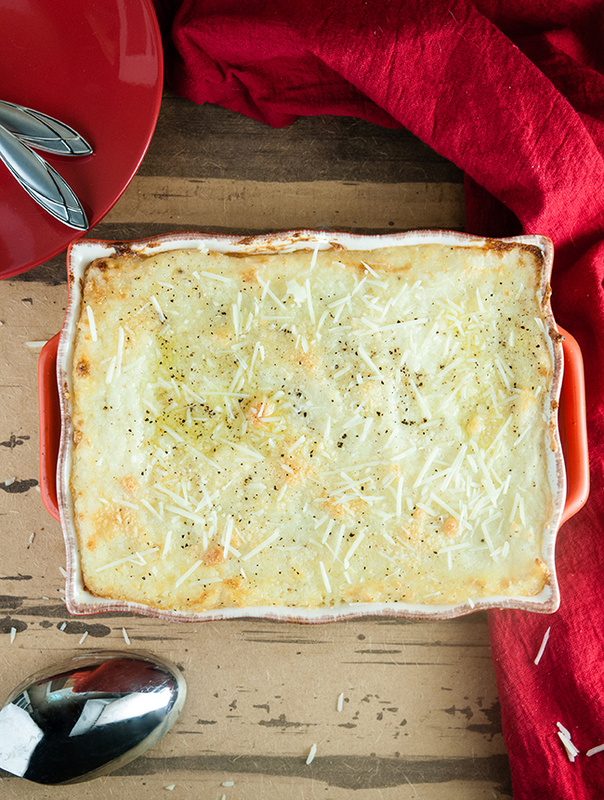 This easy twice baked potato casserole recipe is a hit for Thanksgiving and Christmas. Recipe originally written November 4, 2016. Updated on November 15, 2018. I love potatoes. Really love them. All kinds of potatoes. Baked potatoes, potato skins, french fries. But mashed potatoes and twice baked potatoes are another level for me. Like allllll the way up here. But even better than good ole mashies? This parmesan garlic twice baked potato casserole. I swear, these are the holy grail of potato goodness. 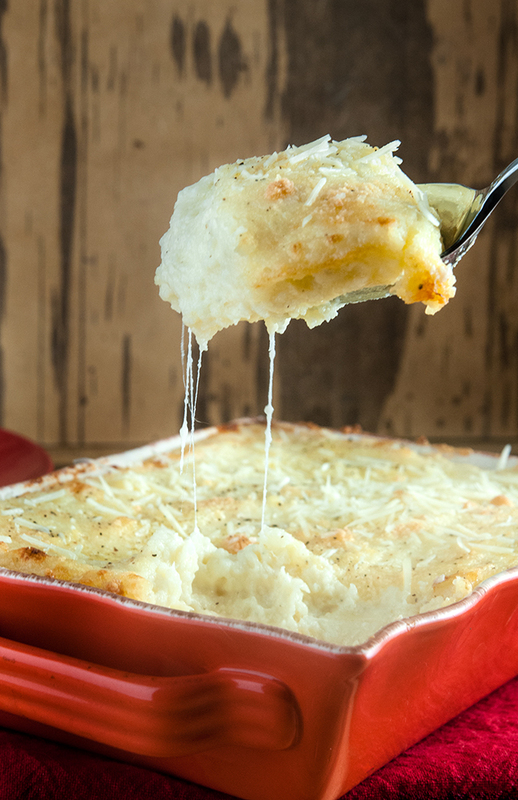 Cheesy, flavorful, creamy, and totally perfect. Now I can’t take all the credit for this idea. No, my grandma should get some of the credit. When I was growing up, my grandma made stuffed potatoes, which were her version of twice baked potatoes. She used to make them for me at least once a week. Because I loved them, and she loved feeding me. I remember being a very little girl, probably not much older than Goose is now, and watching her make the stuffing for the potatoes. Because she was old school, she never wrote anything down. She made them totally based on taste and texture. That suited me just fine though because I got to be the official taste tester. She would hand me spoonfuls of the creamy potato filling and ask what they needed. More salt? More pepper? Milk? Butter? Cheese? I took my job as taste tester very seriously, but they always needed more cheese. Always. And after she added more of the good grated Parmesan cheese to satisfy me, she’d whip them once more with a mixer and then give me the beater to lick. 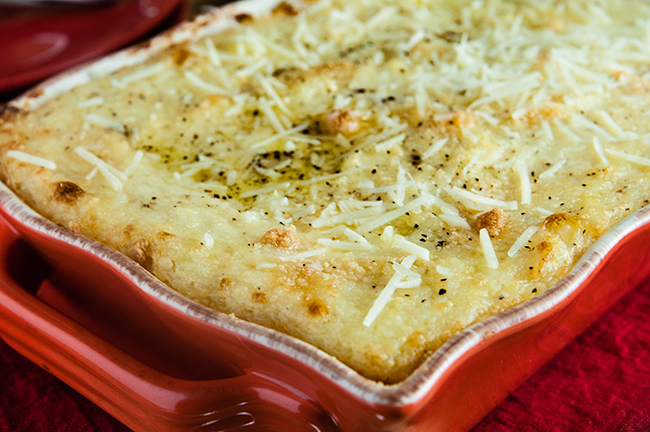 This parmesan garlic twice baked potato casserole is a nod to her and those amazing stuffed potatoes. These are every bit as good as those stuffed potatoes and as traditional mashed potatoes but so much easier to make. There’s no potato peeling like there is with mashed potatoes, and there’s no stuffing the filling back into potato skins the way my grandma used to. At one point in time, I would have gladly stuffed the filling back in, but these days post Goose, I am all about shortcuts and time savers. Layering all the filling in a casserole dish and topping it with more cheese and butter seemed like a great alternative to me. Her method of doing by taste still works for me. I urge you, if you are going to make this recipe, to taste along the way and make adjustments as you go. 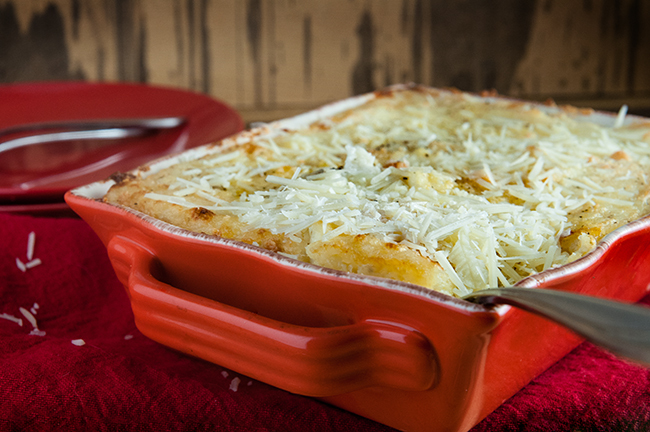 Use Idaho (aka Russet Potatoes or baking potatoes) or Yukon Gold potatoes for best results. Idaho potatoes have a higher starch content so they will be nice and fluffy when you mash them. Yukon Golds are more buttery. Taste, taste, taste! You’ll notice I didn’t include a salt and pepper measurement. I find that because potato sizes vary you’ll need a little more seasoning sometimes. Sometimes you might need more liquid or more butter. Sometimes, you’ll be able to tell by looking at it, but mostly you’ll want to go by taste and mouthfeel. Take the chill off your half and half or cream. Let it come to room temperature before adding it or at the very least warm it up for a few seconds prior to adding it to the potatoes. Adding cold liquid to the potatoes will increase the need for mixing. Do not over mix. Over mixing your potatoes will make the texture sort of gluey. Just don’t do it. 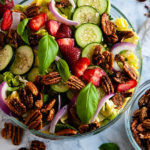 If you want to make these for a holiday dinner and cut down on your prep, you can either bake your potatoes ahead of time (just warm them in the oven for a few minutes before you assemble the casserole) or you can use wrap the potatoes in plastic wrap and bake them in the microwave. Parmesan Garlic Twice Baked Potatoes are an easy, delicious alternative to mashed potatoes. Preheat the oven to 400. Pierce the skin of each potato a few times with a fork. Bake the potatoes for 60 minutes. Let cool. Cut potatoes in half and scoop the insides out into a bowl. Discard the skins. Add the melted butter, pressed garlic, 1/2 of the half and half and 1 cup of Parmesan cheese to the bowl. Mash with a potato masher until smooth or whisk with a hand mixer. Add the remaining half and half as needed until the potatoes reach your desired consistency. Season with salt and pepper . Spray a casserole dish with nonstick spray. Spoon the potatoes into the dish and spread them out evenly. Sprinkle the remaining half cup of cheese on top of the potatoes. Cut up a tablespoon of cold butter and dot it on the top of the potatoes. Bake at 400 for 15-18 minutes or until the top starts to brown slightly. Serve hot. You can bake the potatoes ahead of time. Shop this roasted garlic parmesan twice baked potato recipe! Amazing, it look so delicious! I personally love family recipes. My grandma had a recipe for amazing Chop Suey. After all these years, I still can not recreate her recipe. Maybe it is due to only having it when she vacationed here, or we went to Ohio. 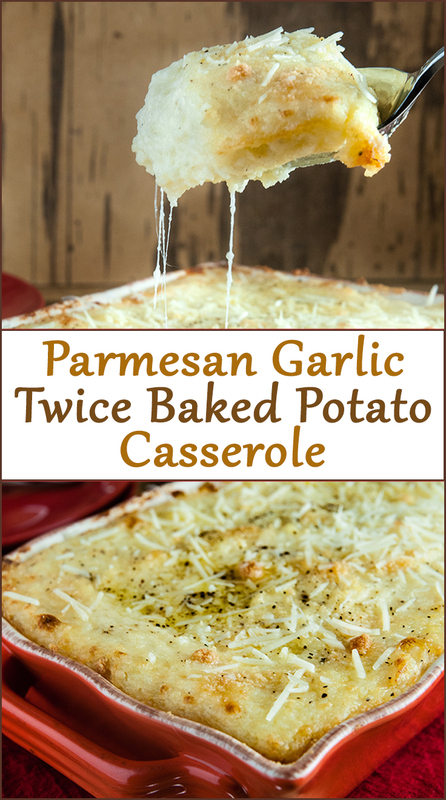 Your Parmesan Garlic twice baked potato casserole might just be what I need to get my husband to try a twice baked potato again. I also love that you have the calorie configuration at the bottom of the recipe. That is a great idea for everyone watching their calories come the holiday season. Family recipes are the best aren’t they? Isn’t it funny how some things Grandma just makes best no matter how hard we try? Well, this just sounds fantastic! What a great idea! Delicious! I love garlic and cheese :). The mixer seems great, too. Yum! 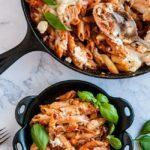 This looks amazing, and great for fall! Oh my gosh this looks so good! I need to try making this. This looks delicious! 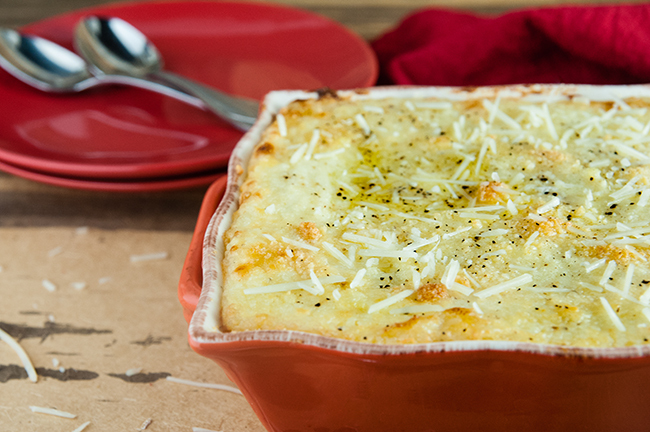 You just can’t go wrong with parmesan and garlic. Garlic and parmesan is such a classic combo. These twice baked potatoes look totally amazing! Potatoes are a weakness so I guess I’m in big trouble! Happy to have this was recipe for the holidays! Ohhhh I hear you on the potato weakness. Mmmmmm, I have never met a potato I didn’t like. 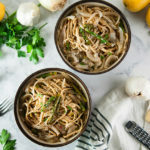 this looks so delicious and would be a great great dish for thanksgiving! Yum! I’ll have to try this recipe out. I’m love anything with potatoes! This looks amazing! I wish I could just reach into the page and grab it! Hahaha, right? I wish I had smell-o-vision when I watch Food Network. You had me at garlic and potatoes. I’m a cheeaselover and i would loe to make this!!!! Parmesan is so much to love!!! Im excited to make this one. Thanks Nathalie! Doesn’t cheese just make everything so much better? I hope you make it and love it. What a good idea, I love twice baked potatoes, but if I make them as a casserole, I can crisp up the skins for another delicious treat. I love potatoes too! Especially when I’m pregnant, I always crave them. 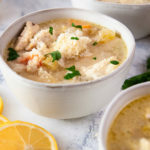 Thanks for the great recipe to try! Mmmmm potatoes are everything. They are a great thing to crave while pregnant. I was all about carbs. But when I was pregnant, my potato craving was Cheddar Cheese pringles. For breakfast. Anyone tried freezing this uncooked and reheating? I’d like to make for Christmas and have frozen twice baked potatoes in the skins. Thoughts? I have not tried that. I’m thinking if you heat up the frozen twice baked potatoes and take them out of their skins it should work just fine. Let me know how it turns out! I’m curious! This looks so yummy! If I were to make this in advance, would I need to cook longer than 15-18 mins to heat all the way through? Probably. I’ll be honest though, I’ve never made it ahead because I love it so much I always eat it like RIGHT NOW. I would up the time to maybe 25-30 minutes. Check it frequently though. It should be fine. Hi Alison! Thank you for pointing that out! I can’t believe I missed it. You add the garlic in the second step when you are mashing the potatoes. The recipe is updated. I hope you make these. This dish is a favorite in our house. Happy cooking!